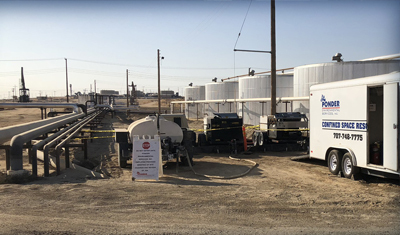 Roll-Off Services : Ponder Environmental Services, Inc.
Our reliable, turn-key service includes delivering quality roll-off containers where and when you need them, then managing the entire disposal process. Roll-off containers are the ideal way to manage the disposal of hazardous and non-hazardous debris and waste at your work site. From construction debris, soil and tree cuttings to non-friable asbestos, roll-off containers provide a convenient, mobile and easily accessible disposal system. 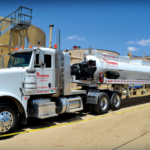 Once delivered to the job site, Ponder Environmental can manage the clean-up process and related services or the bin can be left on location for your team’s use during the duration of the clean-up. Our roll-off containers are available in a variety of sizes and are maintained to the highest industry standards. 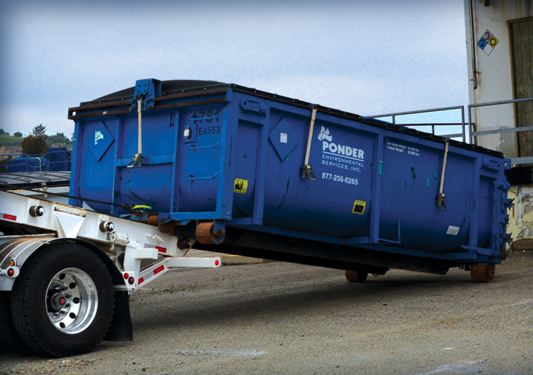 Ponder Environmental’s trucks can haul one or two bins at a time depending on weight, size of the container and configuration of transportation units. 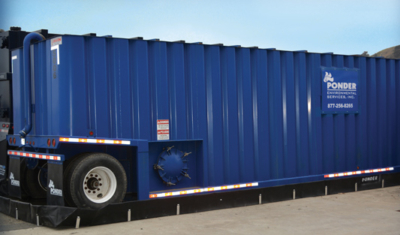 Our 18-yard and 8-yard containers utilize an integrated poly top system that seals the loaded bin for transport. The roll-away poly top slides to either side for easy loading, which maximizes access to the unit. 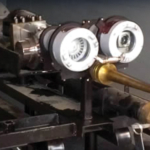 For drilling projects, the containers are used to store the drilling mud prior to lab analysis of the soil. Once the analysis is complete and the proper disposal location is determined, the waste has to be profiled at the designated landfill. 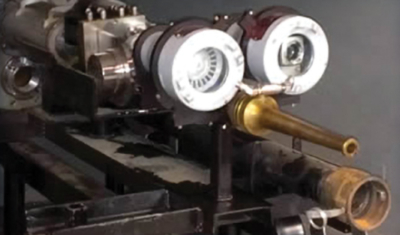 Our long-standing relationships with the local landfills and disposal facilities enable us to facilitate the waste profile process as well as the actual disposal of the waste. 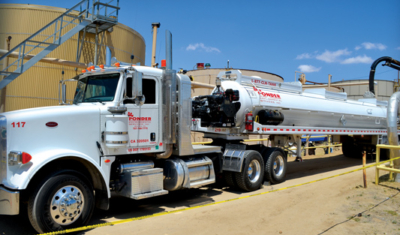 If the loaded waste includes liquid, Ponder Environmental utilizes a vacuum truck to remove the liquid from the bin, transporting the liquid waste to a drilling mud facility for disposal while the remaining solid waste is transported in the roll-off container to the assigned landfill facility.